Since 1986, Liz and Shirley’s passion began with a needle and thread where they both studied fashion design in Adelaide. From the many hours dedicated to their studies, they decided to combine their talents and work as a team. The designing duo both shared the same vision for their dream and Eliza French was born. “Our aim is simple, our girls must walk out with their dream dress and more.” Shirley Vozzo. Eliza French is a boutique couture studio based in Adelaide making only the finest quality “one-off gowns” to the highest standards. Their range of exquisite lace and silk are sourced world wide giving their clients only the best. As well as stunning fabrics, Eliza French also offers a luxury range of embellishments for their brides and a one on one service throughout their whole experience. “The beauty of having an Eliza French gown is that our clients are getting specialised service from the designers themselves, not just the consultation..but the whole process. We make all our gowns ourselves and we fit all our brides personally on their special day. It is so important for us as designers to see the end result on their special day as we feel we are passing our love and creativity onto them and their family.” Liz Chiera. “At Eliza French, each gown is made completely different to the next. We form a special bond and friendship with all our girls as each client must feel special and unique because that’s what we create….special and unique. 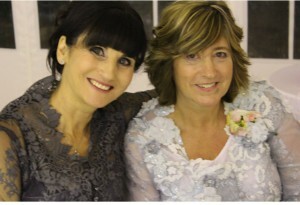 In all the years we have worked together, we have never made the same gown twice.” Shirley Vozzo. “To Sew is to love, a love of time, dedication, sacrifice and beauty…..a vision of elegance stays true in our eyes and our love creates stunning works of art” Elisabetta Chiera and Shirley Vozzo.